Local Rehab Centers vs. Distant Ones: Which Is Better? Does it Matter if Your Drug Rehab Treatment is Local or Far Away? When you are looking for help for your drug or alcohol addiction, you’ll quickly discover that there are many drug rehab facilities that offer treatment all over the country. So where should you go? Does it make a difference if you attend a rehab program that is local versus one that is at a significant distance from you? The short answer is, it depends. For some people, it might be better to attend a local rehab center. For others, it might be better to attend a program that’s far away. Here are some tips from our residential addiction recovery center in Texas on the pros and cons of attending rehab close by versus far off. You don’t have to travel a long way to get to treatment. 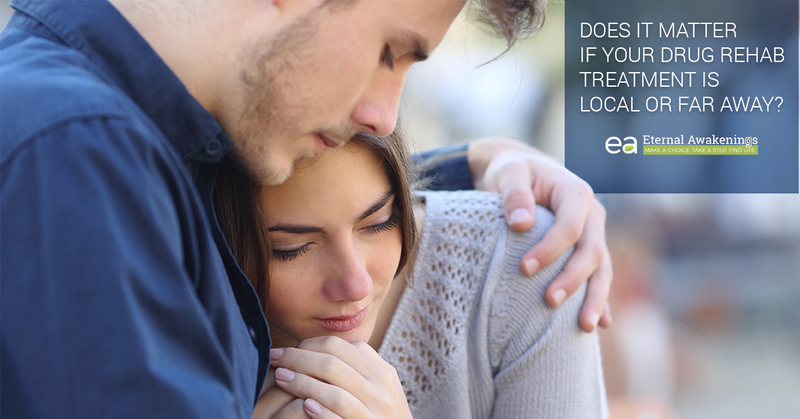 Your family, friends, and support network are nearby and can visit more frequently. You have more choices between inpatient and outpatient treatment, since you already have your own housing arrangements. You can maintain a long-term relationship with the rehab center if you ever need follow-up treatment or counsel. If you can become and stay sober, even in the same community where you’re surrounded by old friends and unhealthy relationships, that is often a very stable, long-term sobriety. Close proximity to old friends and unhealthy relationships can lead to a higher likelihood that you’ll get dragged quickly back into using. You might not take the treatment as seriously as you would have if you had made a drastic change of scenery. Familiarity with your surroundings can mean that you have more triggers, memories, and temptations to deal with in the course of your rehab. You get a change of scenery that can foster changing your thinking and helping you to enter a whole new life. You are removed from any unhealthy relationships with a large amount of physical distance, helping to shield you from anything that would hold you back from recovery. If you need to hide the fact that you were in rehab from nosy people and gossipers, it’s easier to do if you are not in town where you might be seen. It might be fun for you to discover a new city and a new pace of life, kind of like the novelty of going on an extended vacation. If you are very close to your family, and especially if you have children, you might miss them acutely during the course of your treatment if they’re too far away to visit. You might think that you’re stronger than you are at staying sober, just because your usual triggers aren’t present. This can lead to a false sense of confidence when you go back home and an extra-sharp pain of disillusionment if you do fall once you’re back in your own stomping grounds. Here at Eternal Awakenings, many of our residents come from San Antonio, Austin, Houston, Dallas, Fort Worth, and the surrounding communities, but we’ve also had people come from other states to attend our premier Christian drug rehab program that takes place in a beautiful, historic Texas mansion. Find out more about our program and start the enrollment process by contacting us.